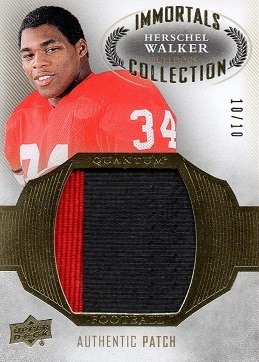 Just added this example of a 2013 Upper Deck Quantum-Immortal Jersey Patches Collection LC-HW of Herschel. 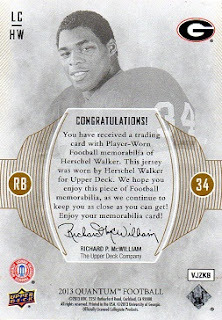 This subset of the Immortal Collection is serial numbered to 10, with this card being #10. Congrats on another great addition to the collection. I love checking out player collections like this. I collect Howie Long and Cliff Branch, Raiders greats that played when I was a kid. You can check out my website http://www.freewebs.com/anthonycasias/ You'll get a kick how Howie Long and Herschel Walker have a lot of cards from the same sets since they played during basically the same time. Look forward to seeing you next addition to your collection. Thanks, Anthony. Howie was a beast for sure. I remember reading about Cliff Branch in Jack Tatum's book, "They Call Me Assassin". He said a lot of guys had speed, but that Branch had absolute blazing speed. I'll check out your site.